Dubai has a sub-tropical, arid climate. Sunny, blue skies can be expected most of the year. Rainfall is infrequent and irregular, falling mainly in winter. Temperatures range from a low of about 10.5deg.C/50deg.F to a high of 48deg.C/118.4deg.F. 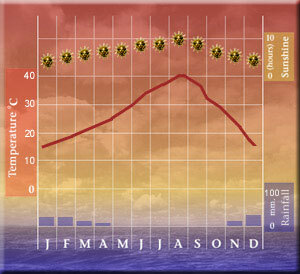 The mean daily maximum is 24deg.C/75.2deg.F in January rising to 41deg.C/105.8deg.F in July. Lightweight summer clothing is suitable for most of the year, but sweaters or jackets may be needed for the winter months, especially in the evenings. Compared with certain parts of the Middle East, Dubai has a very relaxed dress code. However, care should be taken not to give offence by wearing clothing which may be considered revealing, for example low-cut dresses, very short skirts, or tight jeans. Men should always wear a shirt or top in public. At the pool or on the beaches, trunks, swim-suits and bikinis are quite acceptable. Good quality sunglasses are advised, and photochromatic lenses for those who wear spectacles. Hats, or some protection for the head, are advisable when in direct sunlight. » Don't Know Which Hotel To Book ?